Tzedek America will provide a carefully curated day trip for your religious school, day school, youth group or adult learning community. Each trip comes with a tour guide, a customized a field guide for each participant, relevant Jewish text study, debriefing sessions and custom flyer. 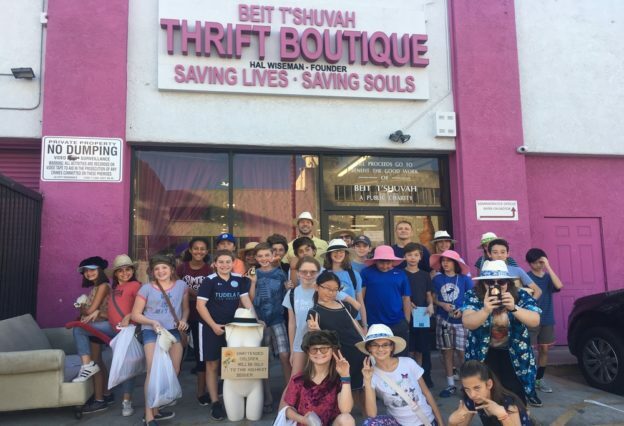 Learning about Social Enterprises and Non–Profits by shopping at thrift shops and meeting the people who work at the non-profits headquarters. Learning about food deserts and food injustices in Los Angeles through the experience, of growing, eating and making food. Environmental justice 101 presentation and an interactive tour of past victories, current campaigns, and an overall tour of community resistance and organizing. A gentrification tour of DTLA and a walking tour of skid row ending in a volunteer project at one of the missions. Participants fundraise, help plan and then implement a Thursday night birthday party for the homeless children at the Union Rescue Mission. Visit various non-profits and social enterprises that work with children and adults with varying special needs. End the day by working alongside special needs adults while helping them sell their products on Venice Beach. This Wednesday night activity is good for teenagers ages 16 years of age an older. We visit Skid Row and participate in a karaoke experience never to be forgotten. Eat at a restaurant owned by a refugees (cost of lunch not included) and hear the owner’s story, meet DACA recipients and meet organizations doing work to help the immigrants and refugees in our country, have an encounter with an ICE agent. This entry was posted on March 26, 2018 by cogency.